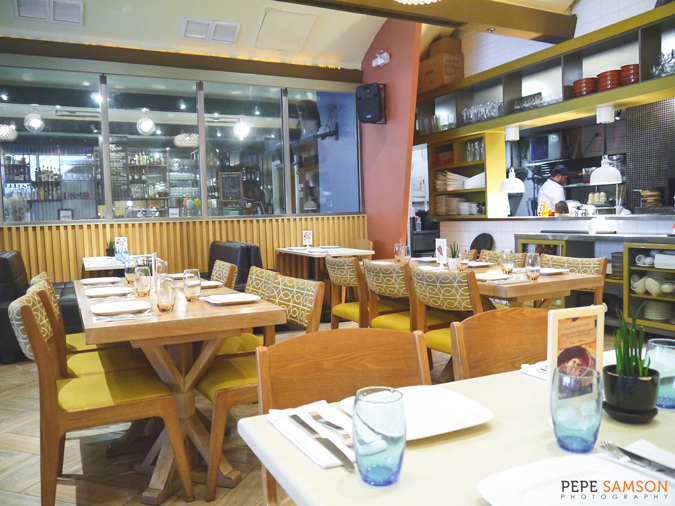 Tucked beside Rocketroom in Bonifacio High Street Central is its sister restaurant, Stella: a casual bistro that specializes in Mediterranean, South American, and West Coast cuisine. Boasting of a rustic menu that features wood-fired dishes, Stella is a favorite hangout spot of the lunch crowds as well as yuppies who like chilling after work. And because Rocketroom is just on the other side of the wall, diners can enjoy Stella’s handcrafted dishes and order a cocktail or two from Rocketroom’s exquisite lineup as well. 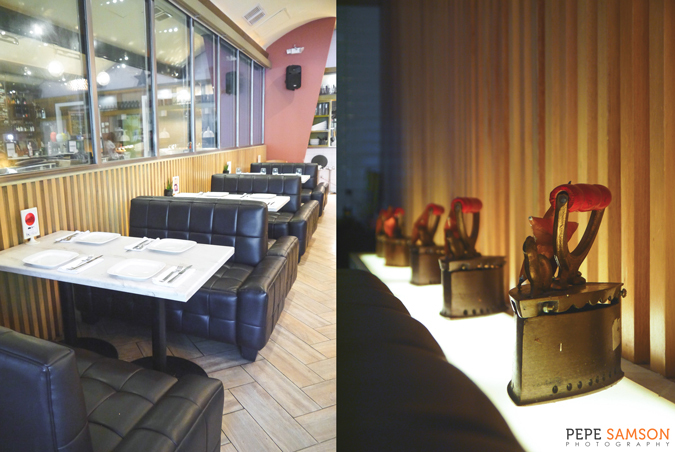 Most of my friends are actually not aware that these two restaurants exist, owing to their somewhat discreet location. But Stella is actually one of the first restaurants in the area—even before the rest of the dessert shops and cafés popped out. 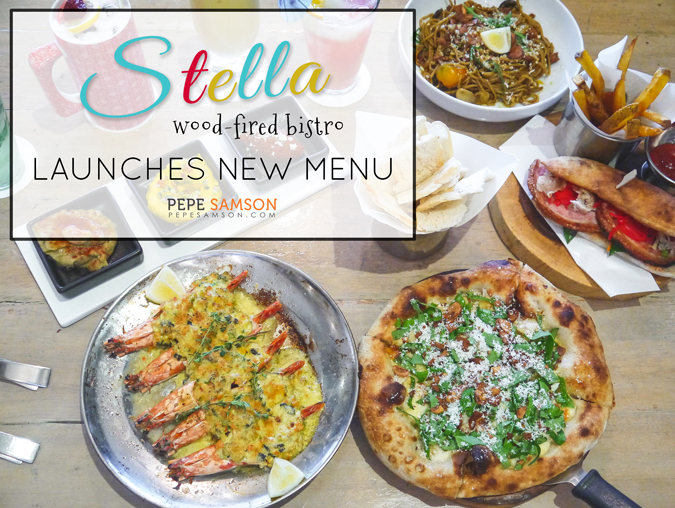 Recently, Stella updated its menu, introducing new dishes that are guaranteed to excite its loyal customers even more! I got to try some of these items, and I must say, almost everything was impressive. 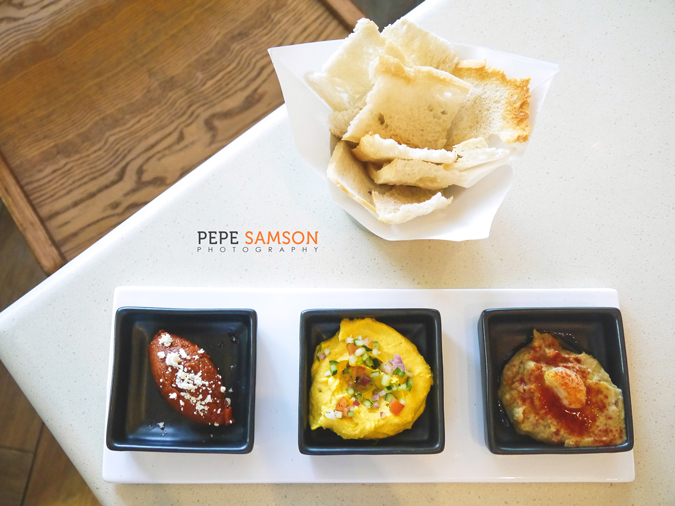 We started with the Trio of Dips (PhP275), which was composed of roasted pumpkin hummus, sundried tomato and red pepper mezze, and truffled baba ghanoush, served with wood-fired crisps. I loved the light tanginess of the sundried tomato, and the richness of the pumpkin hummus. But the baba ghanoush is another story. Here, they mixed two of my favorite things: smoky mashed eggplant and truffle! This was something I refused to share with my lunch mates, LOL! I’ve tried the Garlic Bianca Pizza (PhP350) before when I went to Rocketroom’s Guilty Pleasures, and it was just as good as I remembered it. A chewy pie with crisp edges, it was laden with roasted and toasted garlic, organic baby spinach, and Malagos pecorino cheese. This is one pizza you could finish by yourself. 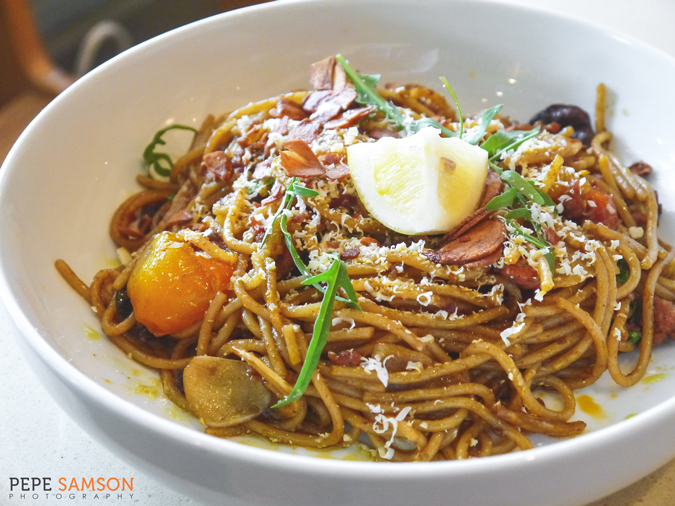 The Housemade Chorizo and Garlic Spaghetti (PhP295) is a must-try for pasta lovers. 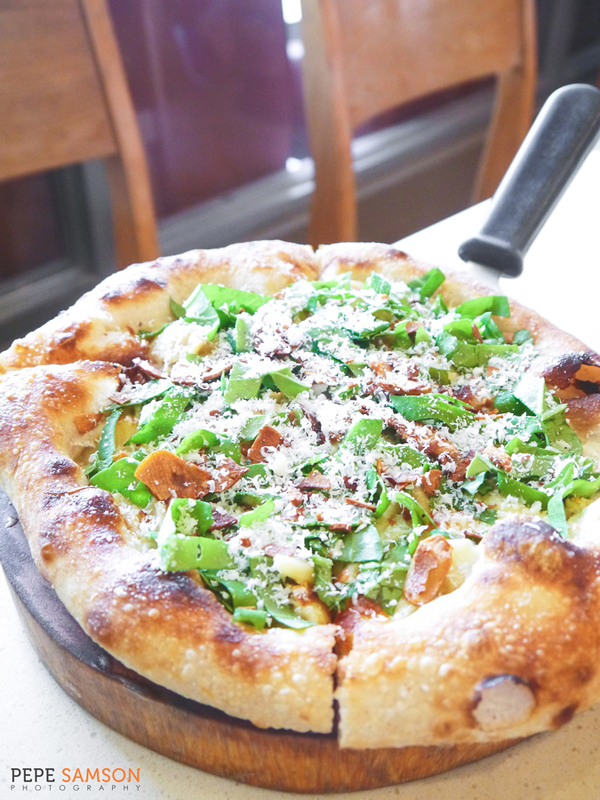 It was so fresh and flavorful, with generous slices of homemade chorizo, juicy roasted tomatoes, arugula, and garlic slivers punctuating each bite. When I go back to Stella, I’m definitely ordering this again! Love porchetta? How about as a sandwich? 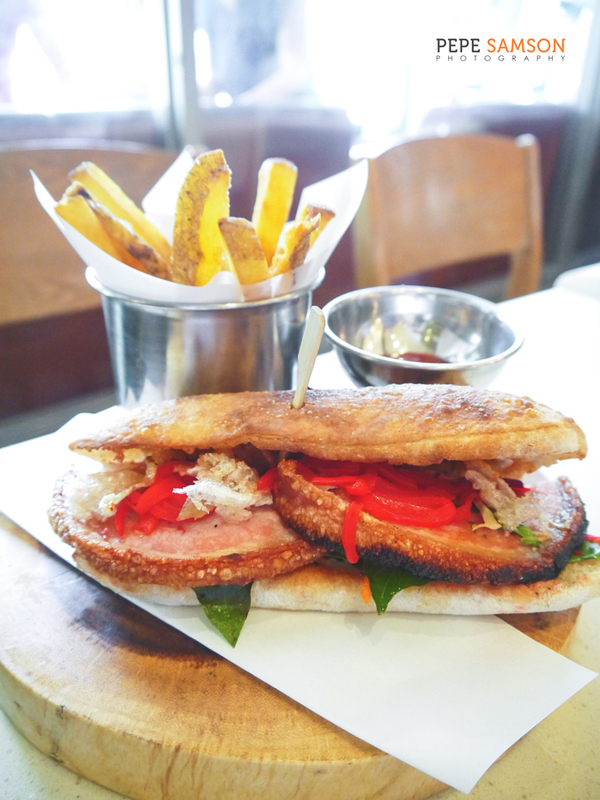 Stella’s Porchetta “Banh Mi” (PhP350) is simply genius: thinly sliced porchetta in between crusty bread, along with shallots, Asian slaw, Sriracha mayo, and cilantro. The porchetta had perfectly crisp skin and juicy meat. Honestly upon first glance, I thought this would destroy my teeth but it was surprisingly tender, with the bread not sending crumbs all over. I loved this! 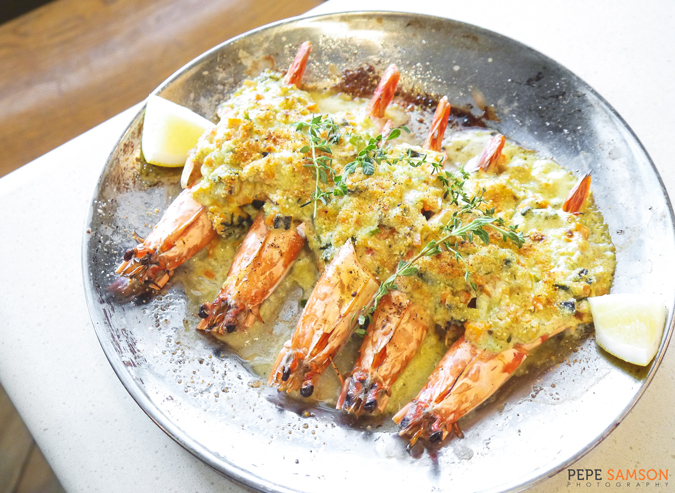 If you like shrimps, try the Chowder-Stuffed Jumbo Prawns (PhP595), served Thermidor-style with mixed seafood cream and fresh lemon. However for this one, I just felt that the cream was too overpowering. 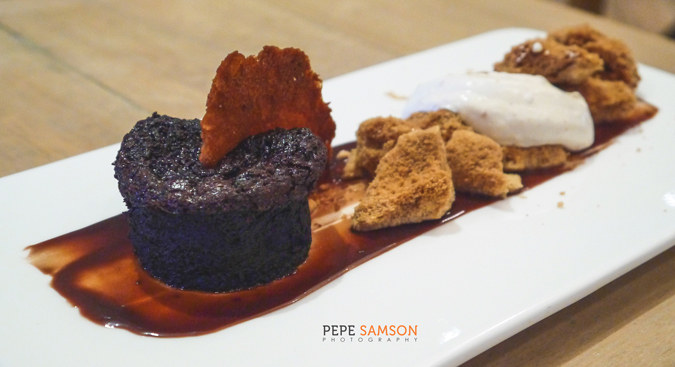 For dessert, there was a Warm Chocolate Raspberry Cake (PhP295), which came with whipped hazelnut mousse, coconut tuile, and fish sauce crumble. Yes, you read that right—fish sauce! Patis! I actually found this dessert too sweet—good thing there were salty crumbles to balance it out. 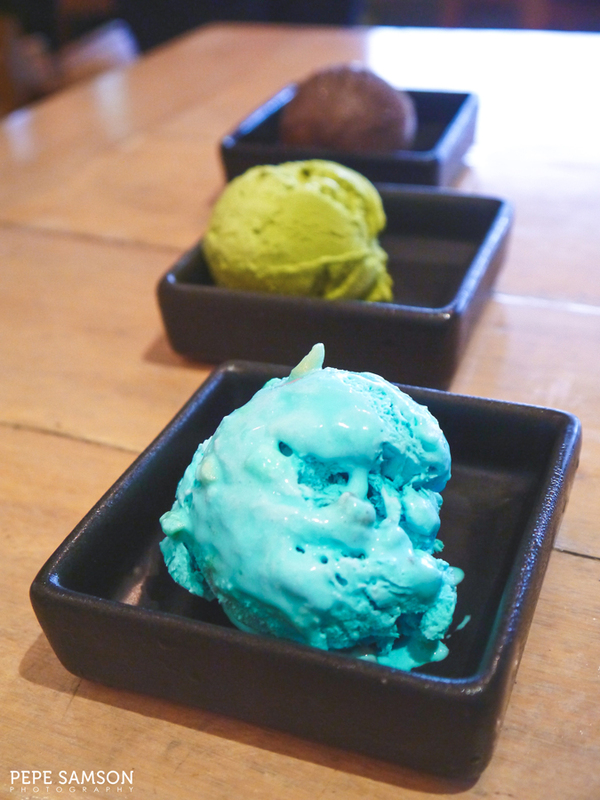 Stella also serves ice cream like avocado, dark chocolate, and bubble gum. Unexpectedly, I loved the bubble gum flavor! The avocado and dark chocolate tasted like the ones served at Vikings. I tried a drink called Cha Cha Chia (PhP225), which I first mistook for a mojito. 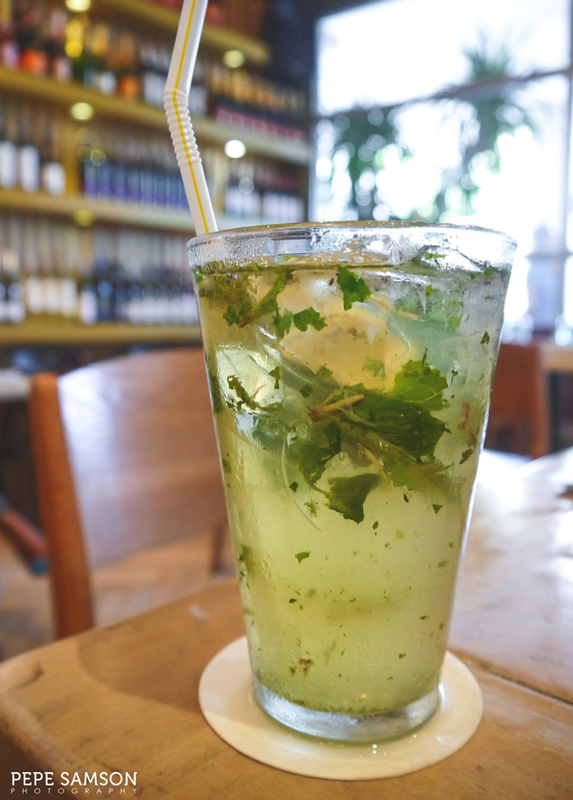 This was made instead of passionfruit syrup and lime soda, then peppered with chia seeds and some mint leaves. It was just as refreshing as a mojito, sans the alcohol. 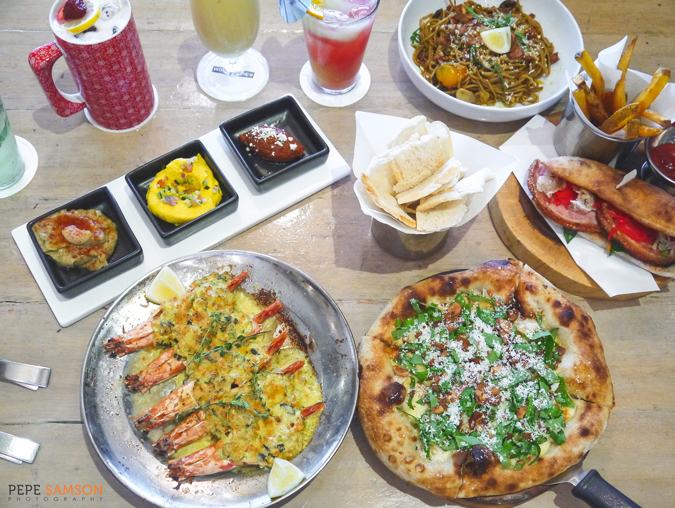 The next time you’re craving for something simple yet unfailingly satisfying, head over to Stella in BHS Central and partake of their delicious and fresh dishes. 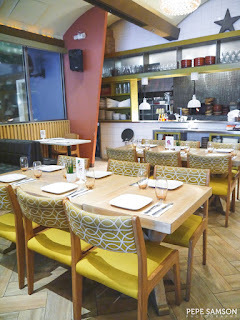 There is so much to try, like the dishes I mentioned above as well as others I don’t have a photo of (like Korean chicken, meatballs that are sooooo freaking good, and herb-crusted tuna loin) and any foodie would admire the awesome simplicity of them all. Make sure you bring your friends or family so you can sample a variety. The price point may be a little on the steep side, but I think Stella is one of the few seriously good restaurants around BGC. 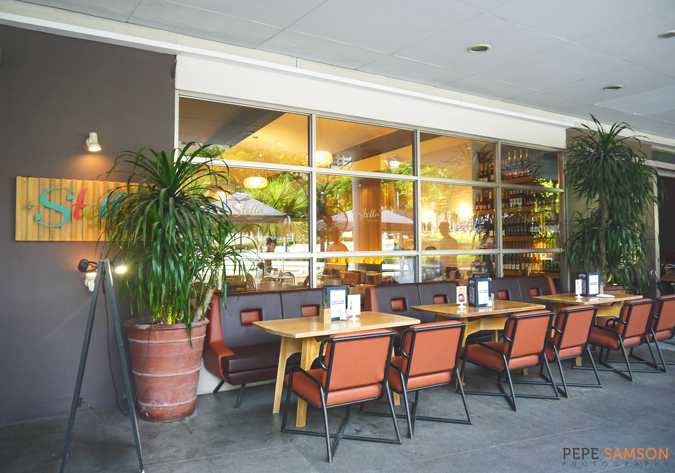 Have you dined at Stella? What do you think of their food? Share your thoughts in the comments section below! My meal was sponsored by Stella Woodfired Bistro. All opinions, however, are my own.